The University of Delaware Library is Delaware’s longest-serving depository, curating the largest collection of federal documents in the state. 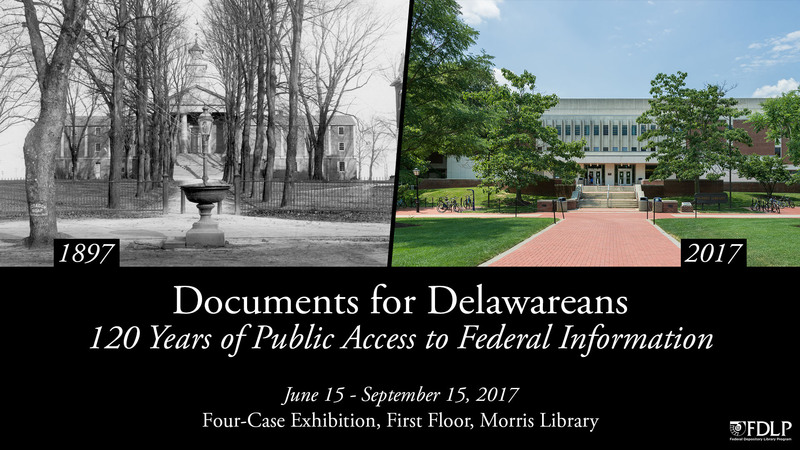 Curated by John Stevenson, associate librarian and interim head of multimedia collections and services, a new four-case exhibition titled “Documents for Delawareans” will celebrate the 120th anniversary of UD’s designation as a repository of federal documents. The exhibition, which will run from June 15 through Sept. 15, showcases United States federal government publications collected through the Federal Depository Library Program (FDLP), or acquired elsewhere, to provide Delaware residents access to federal government information. Materials in the exhibition are drawn from UD Library Special Collections and the circulating collection, including the U.S. Documents Collection. There will be a digital version of the exhibition on this page. Often considered the world’s largest publisher, the United States federal government produces material on a wide range of topics useful in reconstructing the past or planning for the future. An 1813 joint resolution of Congress ordered that certain publications be distributed to libraries outside the federal government, and since that time the FDLP has provided the public with free access to federal government information in partnership with congressionally-designated libraries throughout the nation. Primary sources include photos, drawings, contemporary reports and data from American history. While the anniversary of UD Library’s designation is observed on June 30, documentation shows that the library became a depository between sometime between June 15 and July 1, 1897, sponsored by a United States senator. Depository resources include Delaware’s largest print run of United States Congressional Serial Set volumes, providing access to rich historical source materials contained in documents and reports. The library also provides online access to federally produced materials covering the period between 1817 and 1994. In addition, users will find the state’s most complete run of printed volumes of the Congressional Record, the official record of the debates of Congress. Delaware’s role as a center of industry and commerce is documented in official publications, as are the state’s efforts to attract new industries. Some federal publications deal with local history, such as a 1905 report listing specifications for the Sunflower, a ship based in Edgemoor, Delaware, that provided supplies, fuel, mail and transportation to lighthouses. Others, such as the U.S. Army Corps of Engineers’ 1990 Delaware Hurricane Evacuation Study predict areas likely to be flooded if a hurricane lands at Cape Henlopen. The exhibition will present these and other items in order to suggest the broad range of information produced by the U.S. government over the past 200 years and made available to the public free of charge.